With his size, solid bone and laid back personality, this handsome young guy will fit right in with the warmbloods in the show ring. He has had only 5 starts, with one win in slow time, and it is obvious to his trainer that he is meant for a career other than racing. 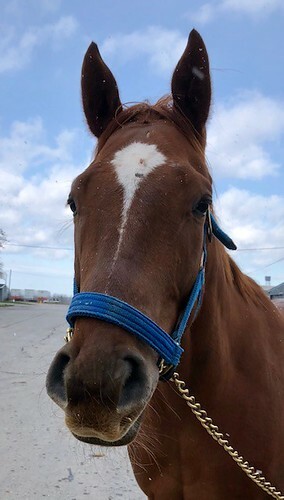 He sure does look to us like a potential star in the show hunter or dressage disciplines, with his very good movement, lightness and balance, and quiet demeanor. We think he will be very happy flowing around a course in a slow soft contact canter! His trainer says he is very sound, and his legs are very clean. He has the sweetest personality, and enjoyed nuzzling with our volunteer. 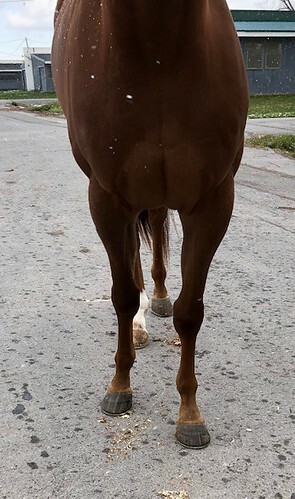 Comeonletsdance is described as an all around good horse, easy and friendly to work with, who handles everything without any fuss. 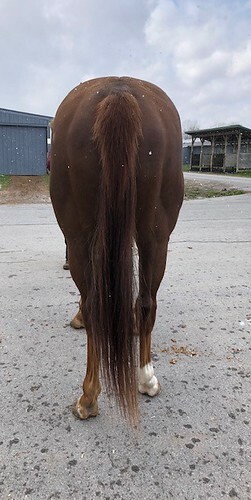 He has an ideal sport horse pedigree. 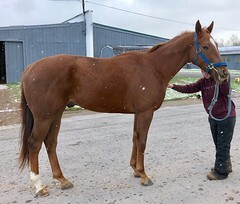 His sire is Comeonmom, a son of Jolie’s Halo from Halo and Sir Ivor and Stage Door Johnny lines. We know of many Comeonmom offspring who are excelling in dressage, hunters, and eventing. Comeonletsdance’s dam is a Grade 1 stakes winning daughter of the great Triple Crown winner Affirmed, with Nijinsky and Sir Ivor on her dam’s side. 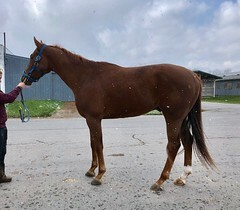 Since he is only three, this already substantial boy will surely grow some more, so he is an excellent prospect for taller riders. Beautiful, sweet, quiet, sound, good moving young geldings offered at reasonable prices are what everyone wants, so we advise calling quickly if you want to get the adorable horse!